Baggage Capacity 55 cu. ft. The Raytheon Beechcraft King Air 200 is a T-tail twin-engine turboprop aircraft from a company known for innovation, functionality, and style. Since its introduction, commercial and civil aviation companies have ordered more than 1,700 King Airs, making it an extremely desirable in its class. Your “200” cockpit has two pilot seats and a jump seat next to the pilot. 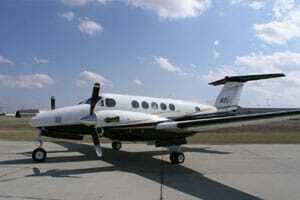 The King Air 200 seats up to 13 passengers in the main cabin, although the typical configuration is for six. There are retractable landing gear and a pressurized cabin. The King Air is known as a “pilot’s plane,” meaning that it leans toward pilot-friendly navigation and mechanics. But it’s also inviting to passengers: The nearly 17-feet of cabin length houses comfortable leather seats with a height of almost five feet, which will accommodate tall passengers with ease. The 200’s twin turboprops are powered by Pratt & Whitney Canada’s PT6 engines generating a maximum speed of 289 mph with a range of 1,885 nautical miles, making it a highly-desirable business jet charter for mid-range flights. 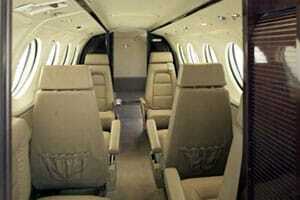 To charter this jet call JetOptions 24/7: (972) 764-3563.